BEA, the French agency for civil aviation safety, said technical work on the cockpit-voice and flight-data recorders from the Boeing 737 Max that crashed in Ethiopia last Sunday has ended. The information from both recorders was successfully downloaded and handed over to the Ethiopian probe team, BEA said in a tweet on Sunday. The U.S. National Transportation Safety Board, the Federal Aviation Administration and Boeing Co. also took part in the technical work. Ethiopia’s probe team now needs to decide which agency it will assign to analyze the data that’s been collected, a spokesman for the BEA said, adding that the French agency is available for such work if needed. Analyzing the data is likely to take “several weeks,” the spokesman said. 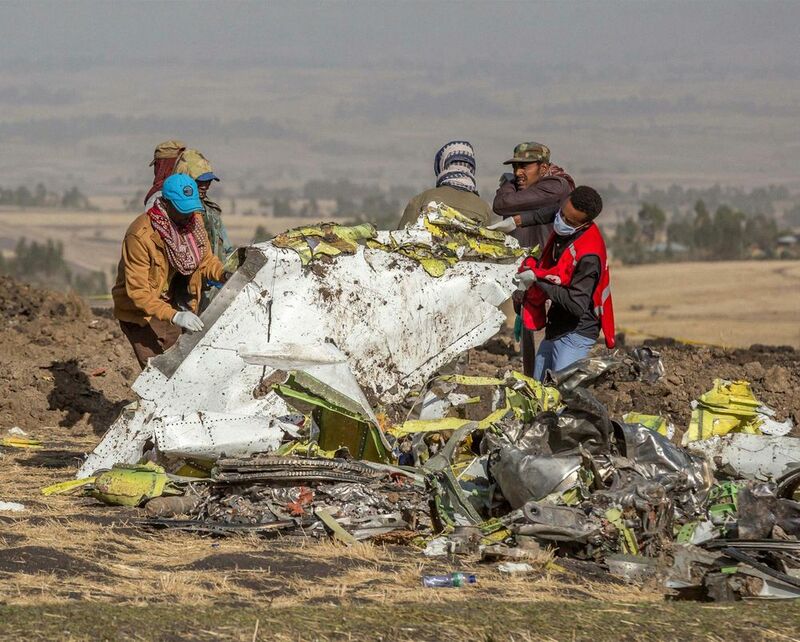 Ethiopia’s Transport Minister Dagmawit Moges said on Saturday that it would take between five and six months to identify the victims of the Ethiopian Airlines jet. All 157 people on the plane were killed in the crash. Black box data from the Ethiopian Airlines plane that crashed a week ago, killing all 157 people aboard, shows a “clear similarity” to the Lion Air disaster five months ago, an official said Sunday. Both of the jets were Boeing 737 MAX 8s. Ethiopia’s transport minister, Dagmawit Moges, made the claim to reporters and said parallels between the two crashes will be the “subject of further study during the investigation.” The government plans to release its findings within one month, Moges said, without elaborating on what the similarities are. “The black box has been found in good condition. That enabled us to extract almost all the data inside,” she said. Even before data from the flight recorder was discovered, countries and airlines grounded their Boeing 737 MAX 8 aircraft. A group of anonymous #Boeing and #FAA engineers said much of the safety analysis was delegated to the 737 MAX manufacturer itself, which cut corners to deliver the plane on time. Its just so unfortunate that this plane crashed and all the passengers on board died..it warms my heart to hear that all data needed to analyse the cause of the accident have been retrieved.. Thank you so much for updating us on this plane crash, I've been trying to follow it up. The best thing to do now for all the parties involved is to put up measures to ensure such incidence does not repeat itself again. It is unfortunate that some like this happens. I would not be surprise if it affects their stock value as well. These kind of information and the thorough investigation afterwards is really needed to avoid such unfortunate incidents in future. Black box data has always been helpful to detect the reasons of this kind of accidents. I'm glad to read this, though it a very sad situation. Everyone on this flight just went like that very healthy beings. Please every thing that needs to fix should be fixed in no time. This is really sad and at the same time scary. I just hope the families get comforted.The data should be effectively analyzed and measures put in place to avoid future occurrence. This is such a tragic news. I pray for all the families of the victims. I hope that this won't happen again in the future. This was one of the saddest news I've ever heard for a very long time. All measures should be put in place to ensure it does not repeat itself again. This was a tragedy that brought to light the Boeing Max aeroplane to the world eyes. Only God knows whether they would have ever consider looking into the make of their planes. It's a bad time for Boeing. I hope all goes well with them. This whole saga won't impact well on Boeing stocks. I feel bad for the investors. I wonder why the planes were not grounded earlier. At least something is being done about it now. I feel sorry for all those who lost their loved ones. This was such a bad tragedy. The results of the investigation should be made public as soon as possible. Many people have been waiting for the answers.